Every freelance editor I know thinks about money, especially in these tough economic times. It isn’t that money is the uppermost concern, but it is pretty darn close. Yet few freelance editors really understand the financial end of our business. Editors tend to look at the money they receive or bill for as the amount they are earning, not realizing that they are actually earning less than they think (or possibly more than they think). For example, someone who charges $25 an hour thinks they are earning $25 an hour. They really aren’t; they are earning less. Why? Because they aren’t thinking in terms of the effective workday hourly rate, which is, in the end, for a business like ours, the only true indicator of what we are earning. This was the meat of what I discussed at the Finding Your Niche conference, but it really needs to be taken one step further than the workday effective hourly rate: it needs to be determined over a longer period of time, even as long as the fiscal year. 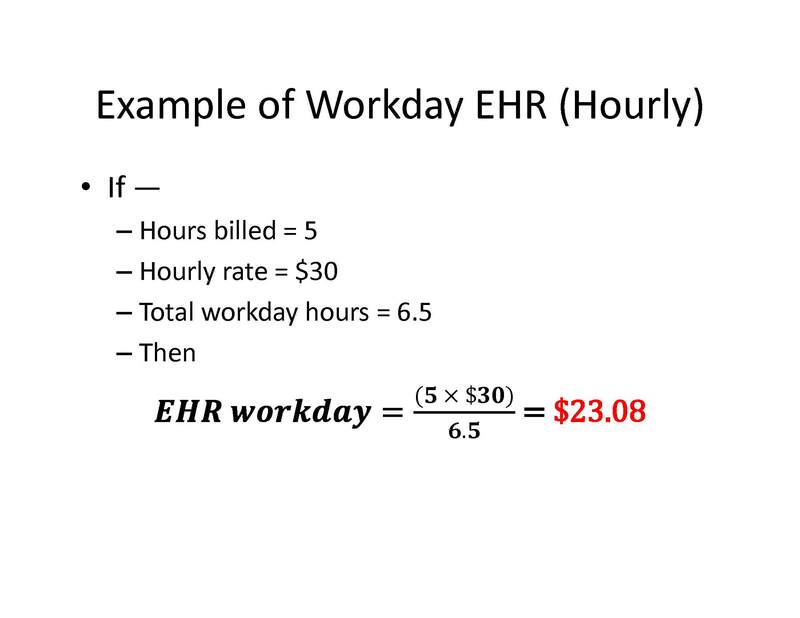 Note how what was once $30 an hour has become significantly less.To have a true picture of what you are earning, you need to calculate your EHR over longer periods — 1 month, 3 months, 6 months, 1 year. Only with that calculation in hand will you know what you are really earning.It is nice to think that we are earning $30 an hour, but we need to recognize that the $30-hour represents billable time and doesn’t include all of the nonbillable time we spend each day, week, and month doing such things as chatting with friends on Facebook, searching for a better source for pet food, and the like. Why is this information important? Because knowing what you are truly earning can help you put your business in proper order. It can be the impetus to seeking more work or to spending less time doing nonproductive things. Freelancers tend to kid themselves about their earnings. Even if we earn a decent income by the end of the year, we may have had to work much too hard to earn it or perhaps we could have increased it significantly had we only worked smarter. 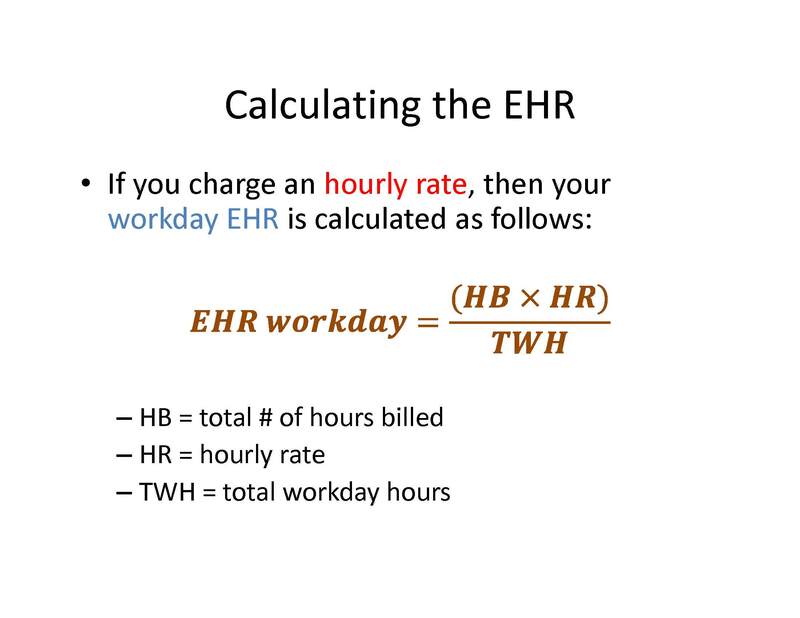 Everything about our business flows out of knowing what our true EHR is over an extended period of time. There’s an easier way to figure what one’s business is paying for work done than you’re foumulas. Divide the total the client pays by the number of hours spent and then divide that by 16 = the hourly salary the editor’s business pays the editor for doing the editing. Hopefully, it will be more than $2.00/hr. You are invited to suggest to your associates, acquaintances, family, friends, customers/clients to read the business articles on our web site to learn why they, like you and I, have something to sell. 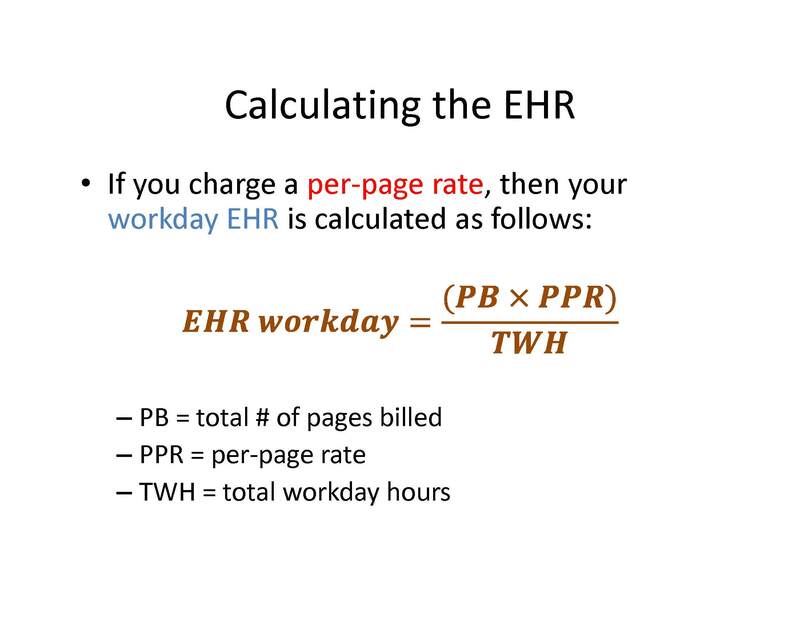 If I charge $50/hour and work on 10 pages an hour, I get … $50/hour. If I become more efficient by using some of the editing tools that you (www.wordsnSync.com), Jack Lyon (www.editorium.com) or Dan Heuman (www.intelligentedit.com) provide and polish off 15 pages in an hour, I still get … $50/hour. I might get more pages done in fewer hours, but then I don’t make as much money as I would if I worked more slowly instead of more efficiently! However, if I charge by the page and can produce 15 pages/hour instead of 10, I’ll make more money. I also am realizing that it does matter how I spend my time throughout the day. I’ve always included non-work time when I calculated roughly how well I’m doing financially, but now I’ll pay a lot more attention to that, and now I have a formula to use in assessing what I’m really earning. Never mind chatting with friends, walking the dog, sourcing pet food; what about all the other ways freelance editors spend their workday hours? For example: providing quotes and proposals, professional training, updating skills, keeping informed about new technologies, networking, marketing and promotion. I am sure that for every hour I spend actually “working” (i.e. paid work) I probably spend half an hour on these other important activities. Reblogged this on Real Writers Write.